Sunday’s special guest on the Ronnie James Dio main stage will be AT THE GATES. The Swedish melodeath overlords are hard at work on the follow up album to 2014’s ‘At War With Reality’ which is set for release on 18th May via Century Media. Check out their latest studio report over on drummer Adrian Erlandsson’s YouTube channel – https://youtu.be/auP9OpZaKaQ. Cruising into a Saturday night special guest slot on the Sophie stage are seminal New Orleans thrash pioneers, EXHORDER. Arguably the creators of the original sound that Pantera honed and took to the masses, when we learned the band had reformed, we *had* to bring them to BLOODSTOCK! Check out their classic 1990 debut studio album, ‘Slaughter In The Vatican’ at https://youtu.be/3pF8S_ssMmI. Las Vegas sludge metal beasts, WEIGHT OF THE TIDE land a Sophie stage slot. The band released second album, ‘All Told’ via Undergroove Records late last year. Check out a taster of that release via the video for ‘The Architect’ here – https://youtu.be/QLWbEYoDdxA. California death metal outfit, SANGRE also join the Sophie stage bill. Not familiar with SANGRE? Then get a taster over at their Bandcamp page – https://sangremetal.bandcamp.com/. If you haven’t grabbed your ticket yet and are a little broke after the Christmas shenanigans, BLOODSTOCK’s payment plan helps ease any ‘lump sum’ shock by breaking your ticket payment into five smaller, more manageable amounts. Sign up in the ticket store any time before 28th Feb for an initial deposit of just £36. Thereafter, four additional instalments of £29 will debit your bank account on 3rd April, 1st May, 1st June and 2nd July respectively. 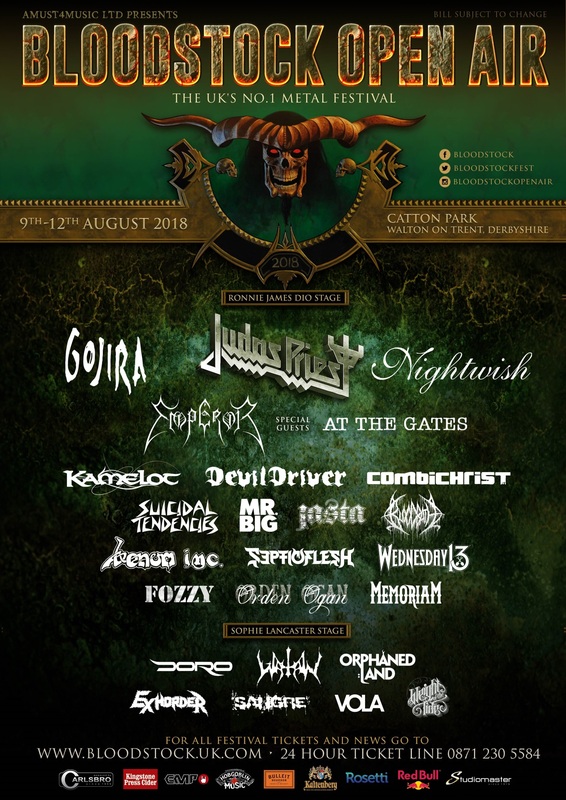 Find out full details or sign up over at https://bloodstock.seetickets.com.